Condo MH1107 - Now You're Vacationing Smart - Come Enjoy our Many Perks! Eden, Wolf Creek, Powder Mountain, Snowbasin Vacation Rental for Family Reunions, Weddings, Ski Vacations and All Other Celebrations! Welcome to Moose Hollow MH1107! Nestled in one of the fastest growing outdoor hot-spots in the American West, Moose Hollow 1107 is the best way to experience all that Eden, UT has to offer. With two world-class resorts, multiple reseviors and streams, hundreds of miles of hiking trails, and some of Utah's best mountain biking, you will have plenty to do on your next vacation! If relaxing is more your style, enjoy the balcony views, relax in the community hot tub, or stretch out on the couch after a long day. Whatever you are looking for, MH1107 has you covered! Main Level: Kitchen, living room with TV, full bathroom, balcony, and bedroom. Downstairs: Bedroom with ensuite bathroom, standard bedroom, full hallway bathroom, and laundry room. Bedroom 1: 1 Queen bedroom with TV, and shared hallway full bathroom. Sofa Sleeper in Living Room. Bedroom 2: 1 King master suite bedroom with TV, and ensuite bathroom. Bedroom 3: Twin over full bunk bed with shared hallway full bathroom. 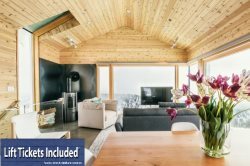 We are truly excited and honored to share our homes with each and every guest and we invite you to stay with us at Powder Mountain Getaways - MH1107!